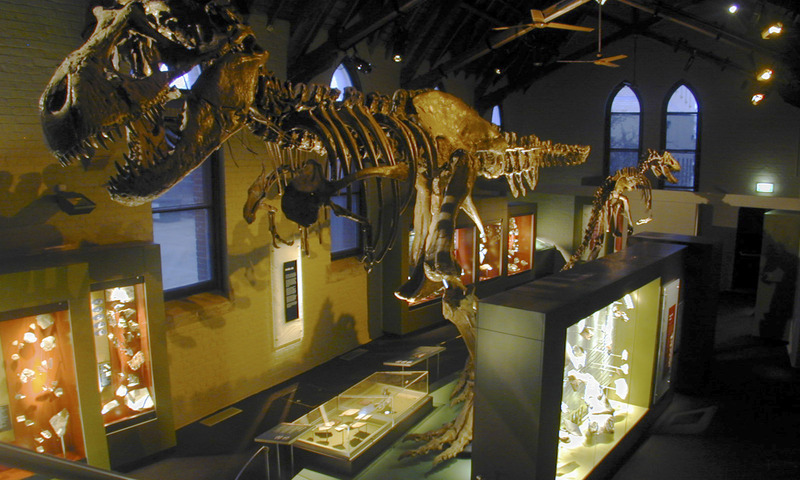 The Australian Fossil and Mineral Museum in Bathurst incorporates two permanent galleries, a temporary gallery and a shop – 1000m2 in total. Thylacine created a design approach that dynamically displays the large and unique collection of fossils and minerals within a significant heritage building. Thylacine’s design embraced the dramatic architecture, and overlaid a clean and contemporary design that incorporates theatrical lighting and floating object displays, to create an engaging environment and visitor experience. Key elements in the exhibition include the central Tyrannosaurus Rex skeleton, which appears to be striding through the lofty Victorian architecture. A carefully positioned mezzanine allows visitors a face-to-face encounter with the specimen, and a theatrical light show adds to the skeleton’s sense of movement and drama.